Minimize Risk. Verify Security. Assure Integrity. With Advanced Instant Ticket Testing by GLI®. 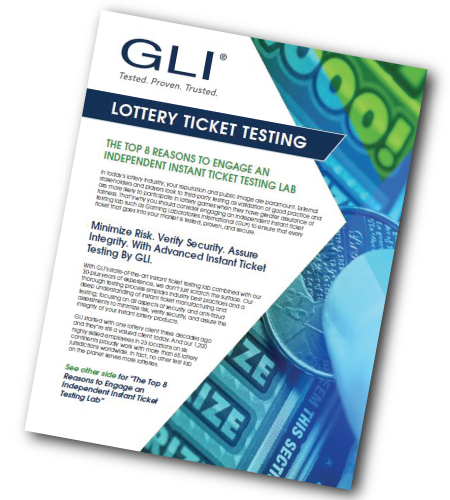 With GLI’s® state-of-the-art instant ticket testing lab combined with our 30-plus years of experience, we’re here to help lotteries and suppliers just like you ensure that every ticket that goes into your market is tested, proven, and secure. We don’t just scratch the surface. Our thorough testing process employs industry best practices and a deep understanding of instant ticket manufacturing and testing; focusing on all aspects of security and anti-fraud assessments to minimize risk, verify security, and assure the integrity of your instant lottery products. Contact GLI today and trust your instant tickets to the world leader in advanced instant ticket testing. Upon hitting submit on the form to the right, you will receive an instant link to download GLI’s Top 8 Reasons to Engage an Independent Instant Ticket Testing Lab. The fields marked * are mandatory. © 2019 Gaming Laboratories International LLC.